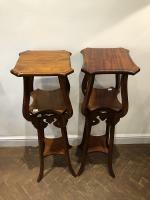 A pair of matching mahogany plant stands. 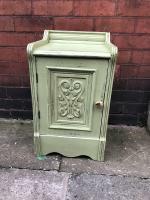 An Edwardian side cabinet C1910 that has been painted up using Annie Sloanes paint and wax. 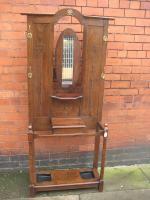 A large Victorian oak hall stand with original brass coat hooks which bear a registration mark. In excellent condition. 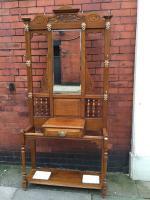 Has the original bevel glass and a small drawer to the centre. 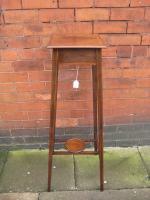 An unusual oak umbrella stand hexagonal in shape. C1910. Moulded top with typical beading detail to the sides. 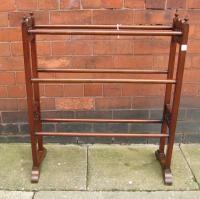 Stands on original castors. 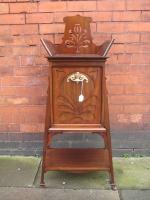 A small attractive oak blanket box C1880. In excellent condition with a clean interior. 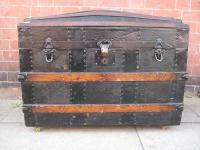 An Edwardian seamans chest in good condition C1910 has it's original leather handles and castors.